Accommodations consist of 2,300 lavish rooms located in 3 towers' (the Royal Tower, the Coral Tower, the Beach Tower, the Bridge Tower), and for those who seek the ultimate in privacy, the Harborside Villas. Regardless of which tower you choose you'll have all the exciting experiences of Atlantis at your doorstep. Even the most basic rooms provide comfortable accommodations for all guests, when they are not out enjoying the gaming and aquatic playground. Luxury and secrenity await you. 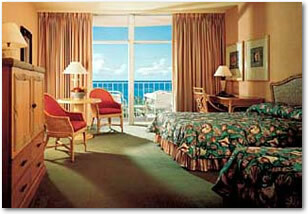 All rooms have french balconies over-looking the mesmerizing waterscape, ocean, marina or harbor. Inviting tropical colors and texrures, plush decor and appointments are featured throughout every guest room. 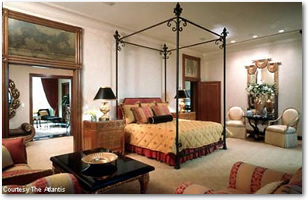 Each luxuriously appointed suite is spacious and offers magnificent views. Bathrooms have green-marble sinks, wall-size mirrorr, hair dryers, Neutrogena toiletries and separate toilet areas. Sliding doors open onto wonderful french balconies overlooking the waterscape and ocean, or the marina and Nassau. The decor is excellent and follows the Atlantis theme, with seashells and fish carved into wooden furniture, and blue and gold carpet in the hallways depicting sea horses and other marine life. »The hotel has a total of 22 handicapped rooms, these rooms are available in all towers. »Additional bedding is available for all guests. »Rollaway beds are available at no charge. »Cribs are available at no charge. The wonderful Royal Towers are crown jewels of Atlantis and the Bahamas. The architecture and decor are stunningly original, featuring unique murals, sculptures and fountains. The most elegant accommodations at Atlantis, the Royal Towers are noted for impeccable service, sumptuous room and suites, and sweeping views of the ocean, the harbor and marina, the pools and waterscapes, and the gardens. The Royal Towers are the newest, most luxurious, and located in the most prestigious surroundings of the resort. 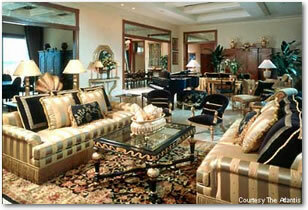 The Royal Towers has a number of room and suite categories, all the way up to the Bridge Suite. The Coral Towers are centrally located between the Beach Tower and the Royal Towers. The Coral Lounge and Atrium Lobby feature inviting, over-stuffed couches, tranquil fountains, skylights and marine-life sculptures. The Coral Towers are only steps away from the Predator Lagoon, the Lagoon Pool and the Casino. 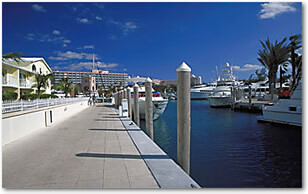 Also nearby are the Crystal Court Shops and dining options at the marina waterfront. Coral Towers is the most centraly located and is therefore close to all of the resort action. Coral Towers includes Terrace Rooms and Waterview Rooms. Coral Towers Terrace rooms feature a large balconies with wonderfull views of the island. 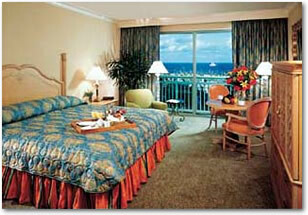 Coral Towers Waterview rooms feature partial or full views of the ocean and the waterscape. Rising above the beach, the casually tropical Beach Tower features abundant flowers and greenery as well as a vast skylight over the lobby. Perfect for those who wish to enjoy all of the resort's features at a competitive price, the Beach Towers is situated on the east end of the resort. Nearby resort features include the Lasy River Ride, the River Pool and Seagrapes Lagoon. The Beach Tower rooms are the most economical and in a quieter location than the rooms in the other two towers. Beach Tower Terrace rooms normally sleep up to 3 adults or 2 adults and 2 children. Beach Tower Terrace rooms feature a large balconies with wonderfull views of the island. Beach Tower Waterview rooms feature partial or full views of the ocean and the waterscape. The Villas at Harborsie Resort are spacious and comfortable. They are located next to the marina. They offer all of the excellent services and amenities of the other accomodations,with the benefit of being a private villa (for those who desire a 'little extra' privacy). 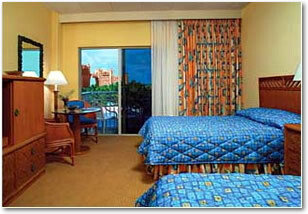 The 5,000 square foot Bridge Suite is a 10-room complex that spans the Royal Towers. 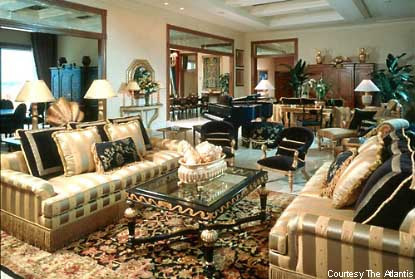 The Atlantis Bridge Suite has the distinction of being the most expensive hotel suite in the world. This suite is located on top of the bridge that connects the two Royal Towers buildings, so it overlooks the entire resort and marina. Most times, it's inhabitants are unknown to the rest of the resort guests, but they have been rumored to include Michael J., Jack N., Donald T., Bill G., and many others. The ten-room suite is tastefully decorated in red, black and gold (lots of gold) and is equiped with its own butler, bar, lounge, entertainment center, as features 12-foot ceilings. 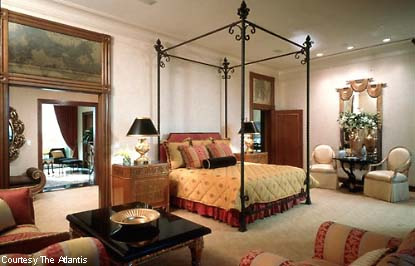 The master bedroom has a sitting area, his-and-hers closets, and hand-painted linens. The bathrooms have chaise lounges, marble baths, and dolphin fixtures. There are two separate master bathrooms. The kitchen has its own entrance for the butler, cook, and other servants.